The fact that she wasn’t a writer was no more likely to keep Ginny Gilder from penning a memoir than the fact that she wasn’t a rower (or even an athlete) would keep her from making the U.S. Olympic rowing team five years after first stepping into a shell. The Capitol Hill–based strategic adviser knows how to make things happen. And that “push through screaming pain/asthma/heartbreak” attitude pervades Course Correction, which recounts Gilder’s journey from a privileged but troubled childhood in Manhattan to first-generation Title IX athlete fighting for the basic facilities that her male counterparts took for granted (oh, like showers) to Olympic silver medalist paying it forward. As she tells it, hers was a mostly single-minded pursuit until a serious loss pushed her from an “abrasive, obnoxious and brash” soloist to someone focused on “generating possibility” for others—from starting Washington Works, a nonprofit aimed at helping women on welfare land livable wage jobs to buying (and keeping local) the Seattle Storm in 2008. Gilder’s memoir is sure to be compared to that other local book about Olympic crew that’s been dominating the best-seller list for a year now (Daniel James Brown’s The Boys in the Boat). But whereas Brown’s recounting of the University of Washington crew team’s victory over the Nazis at the 1936 Berlin games plays epic, Gilder’s tale is intimate. Her darkest demons are internal, and her greatest rewards—living openly with her wife and blended family—deeply personal. 1. In 1976, Gilder helped put a new twist on peaceful demonstrations as part of the infamous Title IX strip protest at Yale. 2. The 56-year-old is now training for the RAMROD (Race Around Mount Rainier in One Day), a 168-mile ultra-marathon cycling event in July boasting an elevation gain of 10,000 feet. 3. In April, Gilder and her fellow Seattle Storm owners opened Force 10 Performance in Redmond, where anyone can train like a pro. 4. 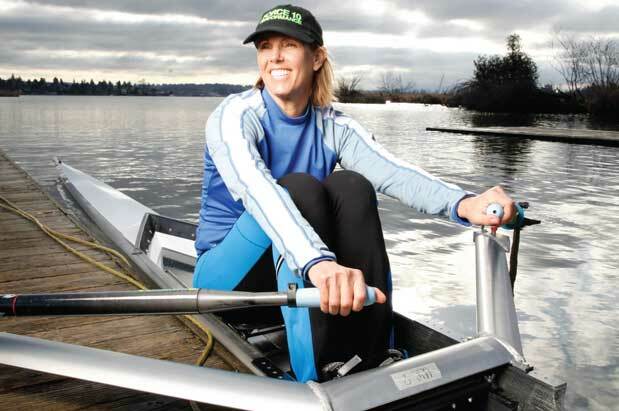 Gilder talks with KUOW-FM’s Marcie Sillman (a fellow rower) on May 5 at Town Hall and with The Boys in the Boat author Daniel James Brown on May 23 at Elliott Bay Book Company.